The book crosses between different fields: between the study of contemporary art, and writing on the aftermath of the Northern Ireland Troubles. In relation to the latter field, Susan McKay’s remarkable book Bear in Mind These Dead (Faber & Faber, 2008) has been hugely inspiring and influential. McKay’s landmark book tells the story of the Troubles in Northern Ireland from the perspective of those who have suffered — whatever their background or involvement. McKay also explores, with great sensitivity and subtlety, the ways in which artists (especially writers) have tried to deal with the traumatic legacies of the conflict. 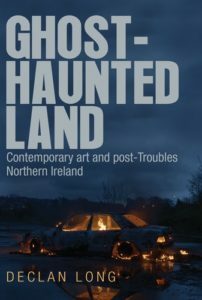 Early in the book, discussing the ways that grief-stricken families remain ‘haunted’ by the presence of those they lost in the conflict, McKay quotes the poet John Hewitt’s description of Northern Ireland as a ‘ghost-haunted land.’ This seemed a fitting phrase to lead my own account of how visual artists have studied the changing landscapes of post-Troubles Northern Ireland. During the course of writing the book, it was an immense privilege to be able to enter conversations with fellow researchers who were reflecting on post-conflict issues in other countries. Especially significant in this regard were two events. one was a symposium entitled ‘Translating In/Justice’ at the extraordinary Dar al-Ma’mun artists’and writers’ residency in Marrakech, Morocco (a series of small houses and an incredible library set in the desert on the outskirts of the city). Here scholars, artists and writers from North Africa, the Middle East and various parts of Europe came together to share perspectives on the aftermath of conflict. It was humbling and very moving to be part of a discussion in which it became possible to see clear correspondences between Northern Ireland and other places (especially with regard to the silences and repressions that come after conflict), but it was also an occasion to learn from others in terms of their own unique situations and experiences. The second, closely related, ‘unexpected place’ was Belgrade, where I also participated in extended discussions about conflict and its aftermath at an event entitled ‘Invisible Violence’: here I was able to learn more about the double-edged condition of conflict resolution: about the twin necessities of moving on, and of properly acknowledging and addressing the legacies of violence. Other ‘unexpected places’, perhaps include the exhibition spaces around the world where works by Northern Ireland’s post-Troubles artists have been displayed over recent years. As discussed in the book, it can feel rather strange to see films, photographs and other artworks related to the aftermath of the Troubles presented at exhibitions such as the Venice Biennale: on such occasions, artworks that capture the deep anxieties of post-conflict Northern Ireland are shown in a setting notorious for art-world spectacle, glamour and excess. The contradictions of such experiences and situations interest me, and have formed a significant part of my account of post-Troubles art. Certainly the most enjoyable aspect of writing the book has been participating in conversations with those who know most about the subject: the artists who have, in all kinds of highly individual ways, tried to respond to changing (and in some ways unchanging) circumstances in Northern Ireland. These artists have been continually striving to avoid and subvert the clichés regarding post-conflict conditions that appear elsewhere in the culture, and have sought, often, to find new terms or points of reference for thinking about this period of history, in this part of the world. Artists such as Willie Doherty or Aisling O’Beirn have formed, in very different ways, bodies of work that refuse easy summations of what this moment of aftermath means — and learning from them has meant continually being conscious of a need to make visible what otherwise might remain hidden as the anxious, hard-won peace is maintained. One of the most challenging tasks in writing this book was to maintain, throughout, a tone and style that fittingly acknowledged the complexity of both the post-Troubles political circumstances and of the selected artists’ distinctive, non-didactic responses to these circumstances. Numerous artists have studied post-Troubles Northern Ireland with great care, imagination and energy — and so it was important throughout, to ensure that their work would not become critically boxed-in by my own ideas. I hope, therefore, that even as I articulate arguments about these artists’ work, I have opened up the work in ways that encourages further interpretation. Perhaps the greatest challenge, however, has been that of how to explore the uncertainties — and problems — of the peace era, contesting, at times, certain rhetorical orthodoxies regarding post-Troubles conditions, while also properly registering the lasting value of the Good Friday Agreement as an historically momentous accord. The book concentrates on the inconsistencies and contradictions of what ‘peace’ has meant — or, more particularly, on how artists have addressed these glitches in the narrative of progress — but it remains essential, at the same time, to remain alert to the real achievements and meaningful, positive changes that have occurred in Northern Ireland over the last two decades. This is my first book — aside from museum and gallery publications, focusing on the work of individual artists. Seeing the cover for the first time was very exciting indeed: not least because the cover image is a powerful shot from a film by the Derry artist Willie Doherty. This image, showing a burning car, is from Remains (2013), which was first shown at a survey exhibition of Doherty’s work in Derry during the Derry/Londonderry City of Culture year in 2013. This was an important year in the resolution of my research, and Doherty’s film was the standout film, for me, in that year’s artistic programme. I’m grateful to Willie for allowing me to use this striking image on the book’s cover. MUP came highly recommended to me for the quality of its books, its significant international reputation and for its ongoing commitment towards publishing books on Irish subjects. For me it was important to have a publisher that would be strong in Irish Studies, but also in art criticism, theory and history. Given the themes of this book — contemporary art and post-Troubles in Northern Ireland — and given that, for most of the last twenty years, I have lived in southern Ireland (where I teach at the National College of Art & Design in Dublin), one potential now is to develop a critical/historical account of contemporary art in the Irish republic during recent times. To some extent, this general material has been covered in other works (such as Fionna Barber’s Art in Ireland Since 1910), but my interest, as it is currently developing, is to focus more narrowly on transformed ideas of place: once again assessing the changing ways in which local concerns regarding Irish art need to be inflected by understanding of more ‘global’ conditions and influences. In this regard, I’m interested in how the types of ‘places’ pre-occupying contemporary artists in Ireland are more likely to be airports, ghost estates, motorways, shopping centres and IKEA stores, than the traditional types of landscape we might associate with visual traditions in Ireland. Category: Art History, Irish Studies	0 Comments.